As a city it is as well known for its arrogant waiters and unfriendly shop staff as it is for its Eiffel Tower. But now, in a move which many will view as long overdue, Paris is finally trying to do something about its world-beating lack of manners. 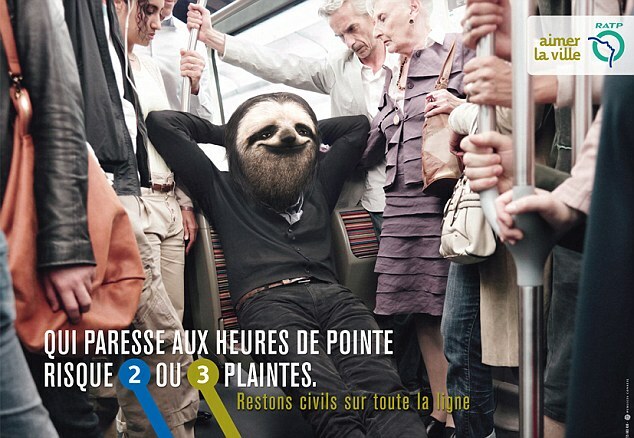 RATP, the city's transport authority, has launched a poster campaign aimed at 'educating' locals in how to behave. 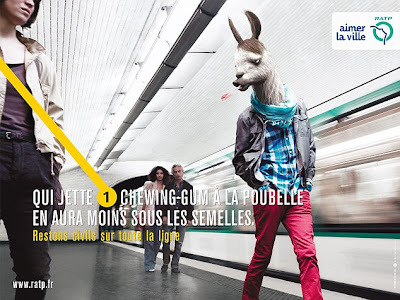 Likening Parisians to animals, it shows a variety of them horrifying onlookers with their selfish behaviour. 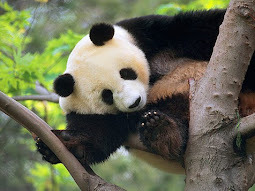 A hen is shown screaming into a mobile phone while sitting on a packed bus, a buffalo shoves his way on to a commuter train, and other shameless beasts are shown annoying people. 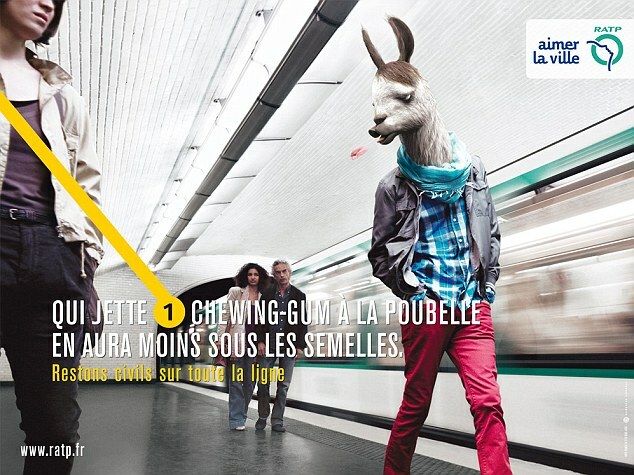 The RATP has also created a website on which people can complain about what they find most annoying about Parisians. 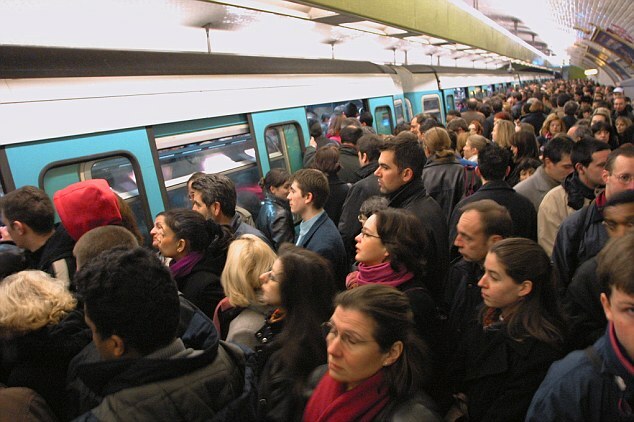 Sociologist Julien Damon, who helped carry out the RATP survey, said: ‘These types of bad behaviour have always existed, but what has changed is that we are less prepared to tolerate them. 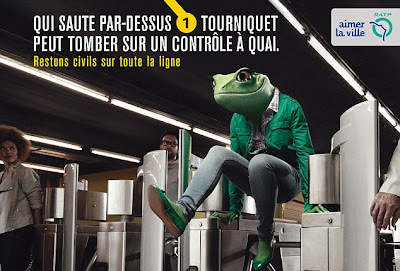 According to a survey commissioned by the RATP, 63 per cent of respondents who admitted to poor etiquette said the ads made them stop and think about their own attitude on public transport. 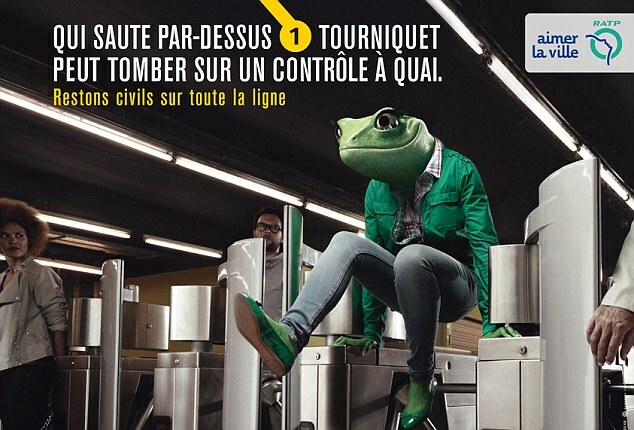 The poll found 97 per cent of RATP passengers had witnessed ‘uncivil’ behaviour on Paris buses and on metro lines. 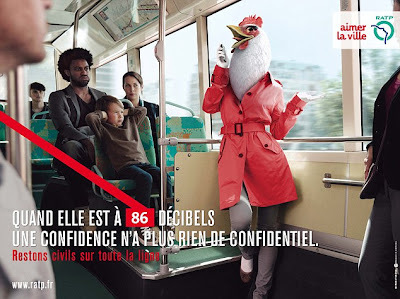 The company published a Top ten list of what most annoyed French commuters, ranging from spitting and swearing to playing loud music on a phone or other hand-held device. The study comes two years after a separate survey of foreigners visiting Paris voted them the rudest people in Europe. The Tripadvisor website research found tourists thought the French capital had the least friendly locals, the rudest taxi drivers and the most hostile and aggressive waiters. Cecile Ernst, French author of the sociological and etiquette essay ‘Bonjour Madame, Merci Monsieur’ argues that the shockingly loutish behaviour of France’s football team during the 2010 World Cup in South Africa, when the players went on strike, was a symptom of a broader social trend. She told France 24 TV channel that when strict social conventions were contested in the 1960s for being bourgeois, rules of civility were also abandoned. ‘People do not feel nostalgia for the social codes themselves, but for the rules marking respect for others and the desire to live together,’ she said.